Most of us know secondhand smoke is bad. But, do you ever wonder how much exposure it takes before your health is negatively impacted? 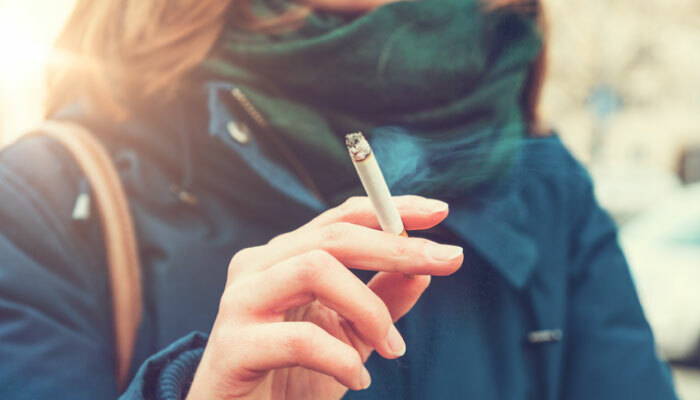 Mary Jo Henry, ARNP, UnityPoint Health, explains secondhand smoke effects, how it impacts pregnancy and children and when you should consider changing your routine to avoid secondhand smoke. Henry describes secondhand smoke as the combination of smoke from the burning end of products, like cigarettes, cigars and pipes, and the smoke exhaled by the person using the product. It’s also known as passive smoking. Most chemicals you encounter from secondhand smoke are known causes of disease and death. Smoke from e-cigarettes and vaporizers is considered secondhand smoke as well, but research is underway to determine just how harmful these newer products are to health. Smoke from marijuana products is also considered secondhand smoke. “Not as much is known about the negative health impacts of marijuana smoke. But, I would say it’s at least, if not more harmful than secondhand smoke from nicotine/tobacco products. Marijuana smoke is especially dangerous for babies and children who can become under the influence of marijuana (known as ‘contact high’),” Henry says. While inhaling smoke from any product is potentially harmful, Henry says smoke from things like fire pits or bonfires typically carry much less risk than repeated exposure to secondhand smoke. “You usually aren’t around recreational fires enough to cause health damages. Also, being outdoors weakens and spreads out the harmful elements in the smoke,” Henry says. Have you ever noticed the lingering smell of smoke in your hair after being in a smoky environment? Henry says that’s called thirdhand smoke. It’s the smoke that remains in the air, clothing, curtains, carpet, furniture and bedding due to repeated smoking. If you are often exposed to thirdhand smoke, you could experience the same health risks as those associated with secondhand smoke. Henry says secondhand smoke affects our bodies in both long-term and short-term ways. Smoke irritates our respiratory system, which includes our nose, throat and lungs. “If I could tell people one important thing about secondhand smoke, it would be that less is best,” Henry says. There’s no known safe amount of secondhand smoke. Henry says it only takes about 30 minutes of exposure before there is a significant amount of detectable nicotine in the blood stream. How quickly it begins to create negative health impacts is different for different people. “For a seemingly healthy adult, a one-time exposure at a place like a casino will not likely cause long-term negative health consequences. While smelling smoke from a car next to you in traffic may be unpleasant, there is little risk to your health because of the short timeframe and low intensity of the exposure,” Henry says. However, she adds anyone with known coronary artery disease (CAD) or lung disease should avoid any exposure to secondhand smoke, even if it’s just for a short time. “When it comes to regular and repeated secondhand smoke exposure, let’s say once a week, for four hours, for more than a year, it will likely cause negative health impacts because of the cumulative effects, even in a healthy adult,” Henry says. The creation, implementation and enforcement of smoke-free ordinances in public and work spaces helps people better avoid secondhand smoke effects. Henry says smoking environments with air filters may help reduce the risk a small amount, but don’t remove the dangers completely. If you are worried about your exposure to secondhand smoke, talk to your doctor about your lifestyle and habits. Secondhand smoke is even more dangerous for babies, young children and teens because their brains and bodies are still developing. Unfortunately, babies and young children are exposed more than adults because they can’t leave the house or car where someone is smoking. The younger a child is when exposed to passive smoke, the more serious the effect on his/her health. 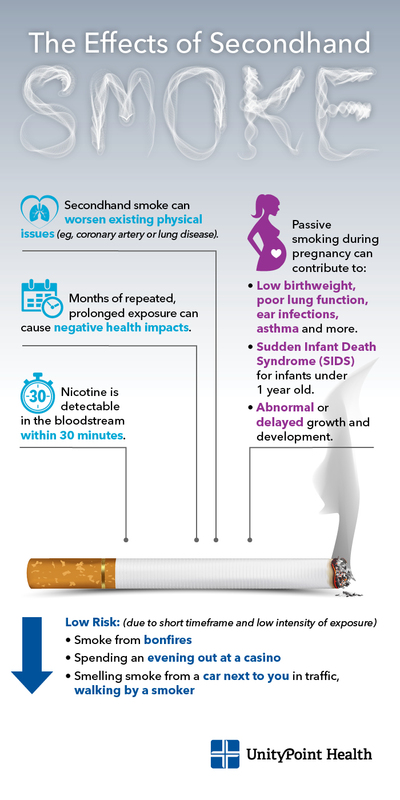 “Secondhand smoke during pregnancy could result in low birthweight, which leads to poor lung function, frequent and chronic ear infections, new diagnosis, or worsening of, asthma. For babies under 1 year of age, secondhand smoke exposure is a risk factor for Sudden Infant Death Syndrome (SIDS),” Henry says. “The best way to minimize continued and future negative health effects of secondhand smoke is to minimize the number of new instances of nicotine addiction. This is challenging, due to new types of nicotine delivery modes gaining popularity, in combination with the billions of dollars spent each year, mostly by tobacco companies, to entice people to use their products,” Henry says. To help reduce addiction, Henry says it’s important to start the conversation about smoke and secondhand smoke effects as early as possible in school-age children. She recommends parents revisit this conversation from time-to-time through adulthood to help reduce the risk of lung disease.